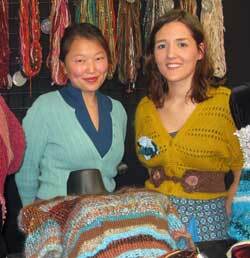 Meet the "knitterati" on the new season of Knitting Daily TV! A note from Kathleen: I just finished watching the 5th season of Knitting Daily TV, and I won't have to wait much longer for the 6th season! Deborah Norville also stopped by the Knitting Daily TV set for a visit. And I've been a fan of Deborah's since she was on the Today Show 20 years ago—knowing she's a knitter (with a new line of yarn!) makes me an even bigger fan. These fantastic ladies plus a bunch of members of what I like to call "The Knitterati" make this season the best yet. Show producers Annie Hartman Bakken and Jaime Guthals are fresh off the set of the new season, and they were kind enough to write up a preview for us. Here they are to give you some more details. Knitting Daily TV is back! We have just wrapped up another fantastic series of Knitting Daily TV taping, with more tips and techniques than ever before and an exciting array of celebrity knitter interviews! Series 600 features such well-known names as Deborah Norville, Debbie Macomber, Debbie Stoller, and Deb Robson (we're calling it the four Deborahs season!). We've also got Amy Butler, Ysolda Teague, and Yumiko Alexander. Plus, we welcomed many returning guests to the set, such as favorite designers and personalities Adina Klein, Laura Bryant, Barry Klein, and Becca Smith! Here's a sneak peek at all the designer spotlights on the new season, full of familiar and famous faces! 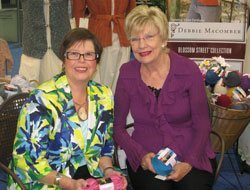 Episode 601: Debbie Macomber shares her storytelling skills with her own rise to knitting and how the craft shaped her career. Episode 602: Debbie Stoller reveals her latest knitting literature and yarn line, as well as her fun knitting personality. Episode 603: Jennifer Edgar shares tips and tricks for maintaining your knitwear and also fixing stains so you can look red-carpet worthy. Episode 604: Author and designer Miriam Felton demonstrates a green lace cowl, a fresh design from her latest book. Episode 605: Designer extraordinaire Yumiko Alexander talks about her innovative designs and shares the Swinging Rope Scarf techniques with viewers. Episode 606: Interweave author Louisa Harding offers advice on how to incorporate ribbons, beads, and even feathers into your finished garments. Episode 607: Carl Coop and Marlaina Bird discuss yak fibers and the how they're great for knitting because of their warmth and defined stitches. Episode 608: KT Baldassaro revisits new ways to use novelty yarns—and not just for scarves! Episode 609: Known for her great fabrics, designer Amy Butler talks about how to make modern color combinations. Episode 610: Ysolda Teague, a fresh face in the industry, demonstrates a fun reversible hat that will appear as a free download on the KDTV site when series 600 airs. Episode 611: Robyn Chachula's new design collection for tots and babies will inspire your own crochet. Episode 612: Colleen East takes a look a luxurious fibers in a beautiful lace patterned scarf, a classic for all skill levels to tackle. Episode 613: Interweave author Lisa Shroyer's new book focuses on great patterns for larger sizes, with fashion forward designs for every day women. We hope you'll tune into your local Public Television station to catch all the upcoming segments, and we'd love to hear what you think. Look for Knitting Daily TV Series 600 to begin airing this coming January 2011! If you can't wait that long, you can always check out seasons past, which are all available in 4-DVD sets.